Site Details provides a high-level overview of the key information relating to the website. The Site title field is mandatroy but you can choose whether or not to display the site title text in the header. If you are going to upload a custom site logo, which includes a site title, you might want to avoid displaying the site title in text form. You can input text for a site subtitle and choose whether or not to display the subtitle text in the header. Set the email address for all correspondence transmitted via the site. Identify and set the site's Homepage by inputting the page's URL alias. On newly-provisioned sites, the Homepage path is set to 'home' by default. The Site Owner's name and email address are displayed on this tab. 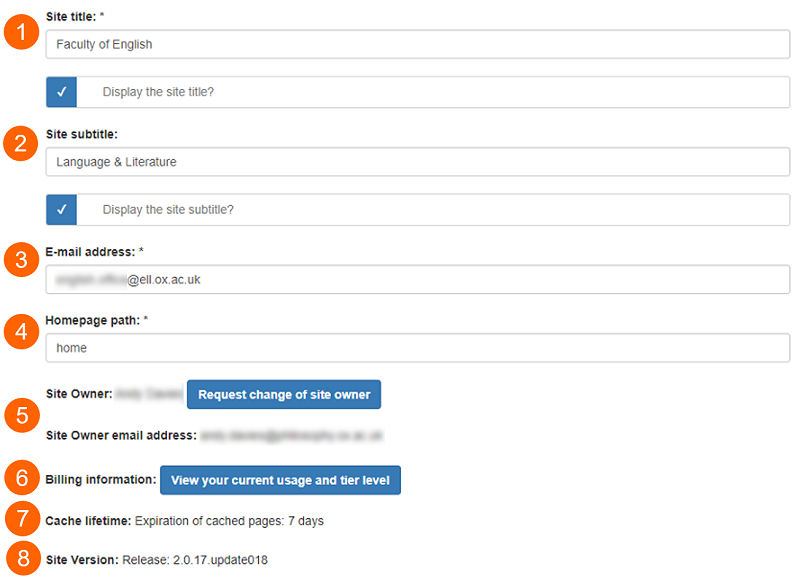 Use the request change of site owner form, linked to from this admin page, to change the Site Owner. Click on the 'View your current usage and tier level' button to view a your site's usage report. The site usage report is updated quarterly, based on the financial year beginning 01 August. The lifetime for cached pages is 7 days. Pages which have not been edited during this period will be purged from the server cache at the end of the 7 days. After this time, if one of these pages is requested, a copy will be cached again. This is the current stable release number for the live Mosaic platform.